First, I have to say how much I enjoyed the diversity in this book – gay, straight, bi, undecided, the mixture of races and financial backgrounds (it’s an exclusive boarding school, after all). And what a perfect creepy setting for a retelling of Macbeth. If you’re going to mess around with Ouija boards, be careful what you wish for – because you may just get it. After Maria, Lily, and Brandon attempt to make contact with spirits using a Ouija board, their lives descend into a dark spiral of revenge, regret, distrust, and redemption. I thought the author did a wonderful job at creating believable characters who, as teenagers, don’t always think about long term effects of their decisions or see much past their own goals and desires. The dialogue is exceptional and humorous at times. And the supernatural elements – fantastic! Eerie, look over your shoulder, make sure the windows and doors are locked kinds of moments. I’ll never look at fog over a lake in quite the same way again. Something that didn’t quite ring true for me was during an investigation when police chose not to followup on information that the injured person was seen earlier that evening with someone, even though one of the students overheard them call it a ‘criminal investigation’. Lily’s transformation also seemed a bit sudden and Maria’s thinking and actions occasionally flip-flopped, which was a bit confusing. 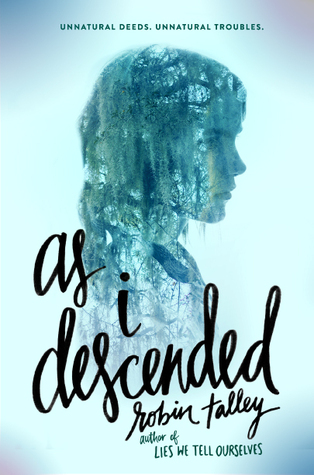 As I Descended is a captivating read that would appeal to supernatural/horror fans and one I’d recommend. This book is scheduled for publication September 6th, 2016. Thanks to Edelweiss and the publisher for an ARC in exchange for an honest review.